He’s a case study in the moral inadequacy of authenticity. 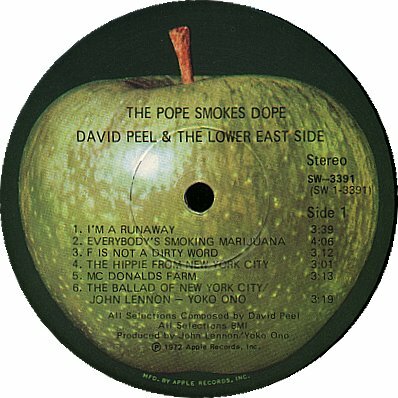 – Christgau on David Peel’s 1972 album, The Pope Smokes Dope. Classic one-liner, positively Wildean in scope, though I leave it up to you to determine if he’s referring to Peel or to the Pope. There’s a Peel song called “Lower East Side,” vaguely Fugs-like, that works great in that A.J. Weberman documentary. He’s all over the film himself. I doubt I could last through a full album. Next Next post: Boston Phoenix R.I.P.